While you may opt for a jacket with many big pockets, this may not be very practical. A simple bag made from a sack. 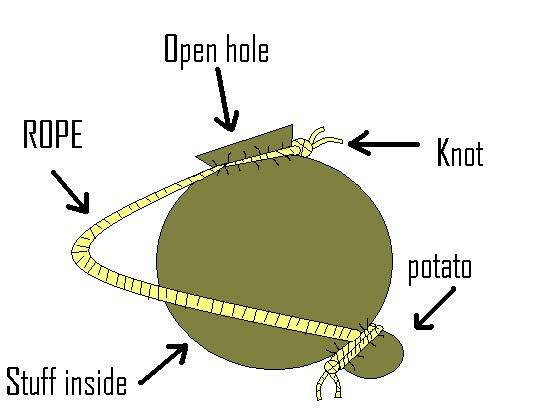 The potato in this diagram could be a rounded rock or a tennis ball. The most basic bag is a strong sack, better than nothing and with the addition of some basic rope you have a way to close it and attach it to your back to carry it. It’s worth knowing about this basic improvisation because for some it will be all there is. it should be noted that the sack could have two straps instead of one. The next step up is a simple small day pack, similar you what school students might have. the advantages will be: more solid fabric, more comfortable straps, larger comfortable load, additional compartment for smaller items and to keep things more ordered. the deluxe solution is a sport/hiking day pack where the additional features are: Even more compartments, very comfortable straps and the likely addition of a water bladder compartment. Adding a water bladder will allow you to carefully control your hydration which will keep you more comfortable for longer. If you require a longer journey a larger hiking backpack will be what you need , it will essentially be an even larger version of the hiking day pack, and obviously allow you to carry a larger weight and volume of things. Posted in Collapse scenario, EDC, Scram Bag. In a sudden collapse you may have to leave where you are in a hurry. To do this effectively you will need to be prepared. It’s easy to forget an important item if you are in a rush. It’s also easy to overlook an important item if you haven’t thought carefully about what you might need to face the challenges in your journey. The first thing to consider is should you go now. In some cases the storm will blow over and traveling might be more dangerous than staying where you are. After all you will be leaving everything else you possess and have access to behind. The other important factor is where are you going to go an what will you need there? So a scram bag is a bag of important items you need for the type of journey you need to undertake, the length of journey and the environment you will be facing. So despite what advice you may get, you will need to adjust the items chosen to suit your circumstances. firstly I will state that I’m not advocating the use of items used specifically to wound other people. If you decide to not take this advice, it is you option and your liability. Many common everyday items can be used in such a way if you think creatively, and you should hope it does not come to that. The best advice to try to reach a peaceful solution, or simply run away. The idea behind a scram bag is so you can run away from trouble, keep with the philosophy. Try to travel as light as possible, you may find things along the way that you might want to take. so keep a little extra room if possible. You may find the scram bag useful in everyday life, after all its full of useful things. Perhaps keep it in your car, or carry it with you on your back when you go places. You should feel comfortable carrying it for long periods of time, because when you need it you will be carrying it for long periods of time , it will be almost everything you have for quite some time. Once you get to where you are going many of the things in it will probably be useful for setting yourself up more permanently. It s assumed in most cases the scram bag will have enough supplies for 3 days (72 hours) if you need to travel longer you will need a bigger bag and/or be able to resupply on the way( get more food/water, wash clothes, recharge, rest properly). Posted in Collapse scenario, Scram Bag, Sudden crisis. Once you have settled down you will realize the impact you will have on your environment. Perhaps not initially but eventually you will notice trees and wood will start to become scarce. You have been using solid wood as fuel in a rather in efficient way. 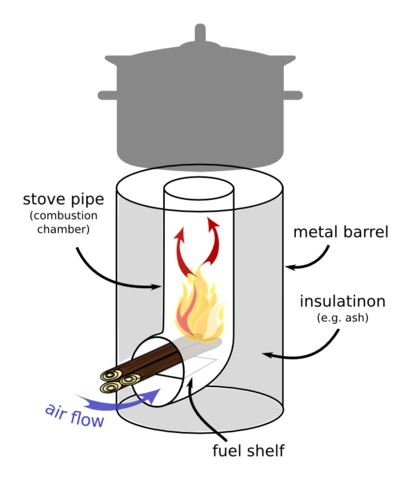 A rocket stove works by concentrating heat and constraining air flow into a small space, creating a small fire storm which more efficiently converts wood fuel into heat. The rocket stove also utilizes very small pieces of wood which would not be very useful in a traditional open fire apart from being kindling. Normal small size rocket stove made from metal. The rocket stove is a solution to this inefficiency. Made of a large can with metal tubes and insulated with vermiculite or other insulator. A device such as this allows you to turn twigs and small branches into a way to heat your home, boil water or cook food. this is the majority of your energy expenditure in your home so its a great saving in a long recession, if that’s the storm you are weathering. 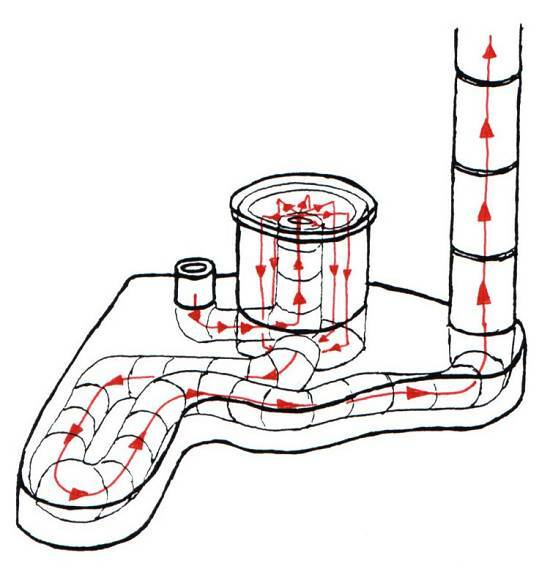 Room size rocket stove design. It would be interesting if there are designs that contain no metal at all, such as an all fired clay design. The smaller designs are portable but a little large for longer journeys, where a different solution might be preferable. There are custom built designs just for boiling water. Posted in Collapse scenario, Energy, Fire, Long Emergency, Long term, Thermal. Coming in at number 4 on the list. It’s actually hard to separate the items at this level of the list but this one wins the spot based on multiple uses and compact size. Multi tools with pliers built in are less useful than you think. you would be better of with an actual set of pliers of that size once you consider cost and strength of the pliers.Certainly some situations require pliers but if you really need pliers you might as well get vice grips which are self locking pliers. Compare the cost of multi tool with pliers versus a good pocket knife and a good set of vice grips. So we have narrowed it back done to pocket knifes really. Knife: the blade must lock and be very sturdy when locked. A knife will allow you to modify and construct many things. Screwdriver: Phillips (+) and flat head (-). very few tools can improvise the screwdriver well. Leather needle: allows some really versatile sewing with thick fabrics and threads. imagine sewing para cord through thick vinyl. Saw: being able to make a straight cut is great for making things from branch size wood. much faster and safer then hacking with straight blade. Fish scaler: for obvious reasons. Bottle/can opener: these are only really useful if there are bottles and cans around. Bit driver: you need the bits and the uses are somewhat limited. Propane torch: I saw these additions years ago, great for wet wood, nice but shouldn’t rely on it. USB key: Most of the ones i have seen were very small in capacity. Fork: Nice idea but are you really gonna eat off it? Parcel hook: Carrying a parcel wrapped in string is not useful. It’s easy to buy a knife/tool with lots of extra attachments which will only make the tool heavier bulkier and more unwieldy to use. Be prepared to spend on this item as it’s a solution for so many problems and it’s one of few hand tools you will be likely to have. Stick to major brand names that have a reputation for quality. Check the legality of carrying knives where you live. In some cases you can claim you are carrying a knife for cutting up apples (because that how you like them) in case you need a reason for carrying one. if there is a way of attaching a key ring or similar item try to find and attach a glow in the dark key ring to the knife. it well help you to find it if you put it down in the dark. In terms of size, be looking at a blade length of about 75mm-125mm. If you ever needed to prove the nagging feeling inside that the mainstream media might be all puppets spouting the same story they are told to, rather than finding out the truth for themselves…this will probably settle it for you. Just a minute an a half of your time. When they report (almost verbatim) the exact same phrase, you know they were reading off the same page. Question is, who provided the page?